This recipe is ideal for Weber Q’s and Weber Family Q’s. Set up your barbecue for indirect cooking with a Convection Tray and Trivet (please refer to your handbook for further instructions). Mix all of the spice rub ingredients together in a bowl. Coat and rub both sides of the pork with the spice mix. Cover and refrigerate for half an hour to marinate. Thirty minutes prior to cooking, take the pork out of the fridge and allow to stand at room temperature. Preheat the barbecue on the lowest setting: Weber Q: control burner on low, Family Q: small burner off, large burner control low. Once the barbecue is preheated, position the pork on top of the trivet in the barbecue. Cook for 3 hours. After 3 hours, place the pork into a large drip pan, pour apple cider vinegar on top and cover tightly with aluminium foil. Cook for a further 1.5 hours. Take the pork off the barbecue and leave to rest for 45 minutes, leaving it in the drip pan and covered with the aluminium foil. After 30 minutes of the resting period prepare the barbecue sauce. Place the butter in a saucepan and cook over a low heat. Once the butter has melted, add the onion and cook for a few minutes or until the onion has softened. Once the onion is cooked add all the remaining sauce ingredients. Cook for a further 10 minutes over a high heat or until thick and sticky, making sure to stir the sauce regularly. Set aside until the pork has rested. Using 2 forks, break the meat into small and medium sized pieces. The meat should be fall apart tender, and break into string like consistency easily. 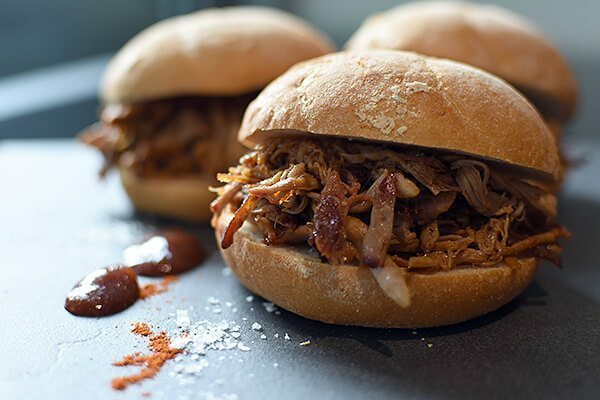 Mix 100ml of the barbecue sauce through the pulled pork.